Let's face it, most of us need small bathroom design ideas. With the average British bathroom measuring just less than three square metres, many of us know the challenge of designing a small bathroom that's functional and aesthetically pleasing all too well. So, if you're designing a small bathroom, we're here to help. From space-enhancing schemes to tips on maximising small bathroom storage, our design ideas are here to help you make the most of a small bathroom, proving once and for all that small can be beautiful. Embrace a small and awkward shaped bathroom and still pack in everything you want with a clever approach to the layout. By pushing the bath to the lower end of this loft bathroom, there's room for a separate shower enclosure. Had the bath been positioned where the shower is now, there would only have been room for a little bathroom storage. This is a much better use of space. Wall-hung sanitaryware will create the illusion of a larger bathroom precisely because you can see the floor beneath the fittings. Exaggerate the effect further by picking minimalist, back-to-the-wall fittings, and choose a light colour for the flooring. If you need any more tips on choosing the best bathroom flooring, check out our guide. Recreate this look using sanitaryware from Coram Showers. While fitted bathroom units are a great option if your priority is maximising storage, they can make a small bathroom feel boxy. An unfitted look not only has the power to make a small bathroom feel spacious, but also creates a more relaxed feel. If space is at a premium, consider scaling down sanitaryware and opting for slimline solutions. Whether that be a slimmer model of toilet, towel rail or bathroom storage, gaining a few extra inches and reducing the 'packed in' feel will make all the difference in a small bathroom. Find out what you need to know about choosing a bathroom sink. Small bathroom storage solutions are an important thing to think about when designing a small bathroom. We love the addition of a ladder shelf to a small space which, in addition to being slimline and maximising vertical space when propped up against a wall, creates an attractive design feature with the addition of fresh towels. 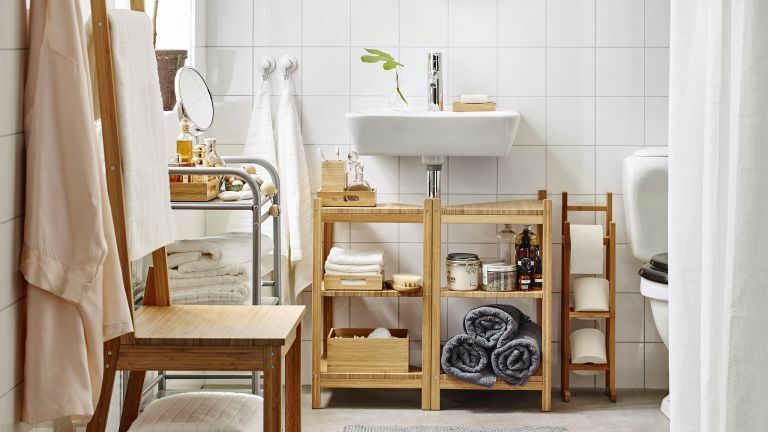 We have loads more small bathroom storage ideas over on our dedicated ideas gallery. Maximising space is an essential step when designing a small bathroom. Take time to think about utilising clever small bathroom storage solutions, particularly those designed to fit what might otherwise be dead space – such as an awkward corner. We love this Silveran Corner Unit from Ikea. If a small bathroom is not designed effectively, a lack of natural light can quickly make it seem dark and dingy. If you're looking for an easy and effective solution, consider an all-white scheme, complete with either fitted or unfitted sanitaryware that (almost) blends in with the the rest of the space. Maximise wall space with these clever storage solutions from Ikea. Open shelving is a great option if you're worried about fitted units making a small bathroom feel boxy. With a more relaxed feel, open shelving not only offers ample storage but makes for a stylish design feature if styled with house plants, folded fresh towels or other attractive bathroom essentials. Desperate for a stylish roll top bath? And why not – they look good and, because they're not boxy like standard fitted baths, they enhance a small space, too. We've rounded up the best freestanding baths, and we think you will find that there are loads of options for smaller bathrooms. This small bathroom scheme performs several subtly clever tricks: the bathroom floor tiles, laid diagonally, create the visual trick of making the floor area seem longer and wider; the bathroom colour scheme – with a dark colour below and a light one above – makes the ceilings seem taller; the double mirrors reflect light and make the room seem larger; and there's bags of small bathroom storage ideas to hide away clutter. For more subtle changes to enhance your space go and check out these nifty bathroom design tricks. Getting the right tile size for a small bathroom, whether for walls or floors, will have a big impact on making your small space feel bigger and brighter. Use our guide to choosing the right size tiles for a small bathroom to enhance your space. A large mirror in a small bathroom will help it feel larger – especially if you've chosen a dramatic dark colour scheme. Picking a round mirror will create a softer feel than a square or rectangular one, and choosing one that's frameless will allow it to look less bulky. All handy tricks in a small bathroom. Find bathroom mirrors in our buyer's guide. It's very likely you'll be using your bathroom for at least half the time when it's dark. So, ensuring the lighting is good – and not just relying on a single overhead bulb – will make it feel bigger when it's dark outside and you can't rely on space-enhancing daylight. Find out more about bathroom lighting in our guide. If your bathroom isn't directly overlooked you might get away with swapping other bathroom window treatments for window film, which look less bulky and allows in maximum light all of the time. See our window film design gallery for more ideas – and explore more bathroom window treatments.